A space frame is a type of lightweight two-way structural system that can be thought of as a 3-D truss. They were really popular in the 1970s, 80s and 90s although Interestingly enough the concept was originally developed by Alexander Graham Bell at the turn of the 20th century. One of the advantages of the system is it can span a long distance using small, lightweight members that are relatively simple and inexpensive to assemble. This, however, is also its weakness: if any one its constituent parts were to fail it can compromise the entire system and cause a catastrophic collapse. There have been several high-profile failures and as a result space frames are rarely used today. 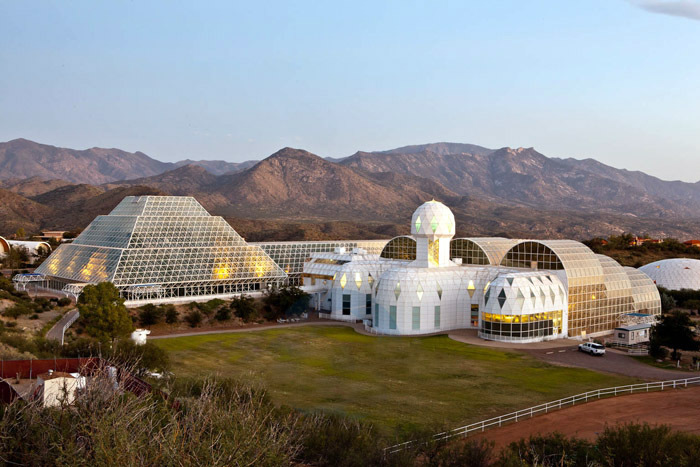 But between 1987 and 1991 the system was used extensively in the construction of Biosphere 2, a structure designed to act as a large-scale closed ecosystem. I had the opportunity to tour the structure last week. It sits about thirty miles north of Tucson and it looks like a futuristic outpost on some distant planet. That was kind of the point: one of the goals of the endeavor was to test how we might make a self-sustaining colony on Mars or a similar alien planet. The plan was for a series of "missions" to be conducted where crews would be lock inside the enclosed structure for years at a time to simulate a mission to another world. Things didn't quite go according to plan. The ambition of the project outstripped the available technology and knowledge and the scientific value (and base motivations) of the project came to be questioned. The private venture was eventually sold to the University of Arizona who owns and operates the facility today. One of the things Biosphere 2's space frame structural system accommodated was the creation of a series of "biomes" that simulated climactic regions found on earth. But in the enclosed environment of Biosphere 2 climactic conditions could be controlled and tested in way that would be impossible in the outside world. What would a few degrees of temperature change do to a rain forest? In Biosphere 2 that question can be tested in a way that would be impossible in the outside world. Biosphere 2 was an exercise in optimism that couldn't quite live up to its promise. The same could be said of the space frame (and the lift slab and the concrete thin shell). Still, the value of any building (or system or endeavor) should be judged not by the degree to which it fulfills its original mission, but by the degree to which it can be adapted to meat a need that comes to exist in the world. The school my daughters go to is located next to the Trinity University campus. Trinity, in case you don't already know, is a private liberal arts college in San Antonio that occupies an amazing campus initially planned by (and populated with several buildings by) O'Neil Ford, the father of Texas modernism. The story behind why Trinity's campus is modern is a long and compelling but to make a long story short, many of the buildings were designed to be constructed using the lift-slab construction technique. The idea is that the floors and roof of a multi-story building are cast on the ground (as opposed to in place) and then lifted into place. At the time this was a cutting-edge technology and allowed the Trinity campus to be built quickly and inexpensively. The technique is not longer commonly practiced after several high-profile collapses occurred during construction of buildings elsewhere. At any rate, the buildings that resulted at Trinity are amazing. They are clear, rational and their open floor plans have proven to be quite flexible. Demolishing interior partitions is as easy as driving a Bobcat through a floor. My daughter was been enjoying watching the work occurring when I drop her off and now ants to do that for a living. 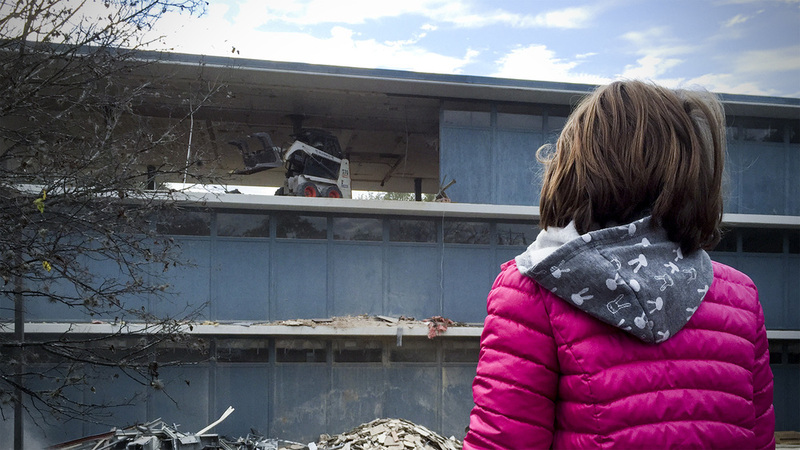 Construction can be cool but demolition - at least to a 5-year-old - is much, much cooler.